In case y’all aren’t sick of pasta (frankly, I never am) I thought I’d quickly share with you one of those shortcut meals I made using odds and ends I had in the fridge today. It was so fast that I whipped it up for lunch. Here’s what I had hanging around. about 1.5 C of the ricotta, mozzarella, parmesan and egg mixture from the Meatball Ziti I prepared a few days ago. Preheated the oven to 350. So here’s what I did with it. I cooked up the pasta al dente and drained it. Meanwhile, I warmed up the two leftover sauces in the empty pasta pot. While it was warming, I sprayed a casserole dish with cooking spray. Then I ladled a little sauce into the bottom of the dish to cover it. I then threw the pasta and all the cheese mixture into the sauce pot and just blended it all until it was well-mixed. It takes a little warmth to un-chunk the cheese from the refrigerator. Once it was all mixed, I dumped it into the casserole. Because I wanted a little more sauce, I drained a can of Hunts Fire-Roasted Tomatoes and dumped it over the top of the pasta mixture, spreading it out evenly with a spoon. Lastly, I evenly covered the pasta with shredded mozzarella. I baked it covered in foil in the oven for 35 minutes. Then I removed the foil and let the cheese brown for 10 more minutes. Voila. I swear – it was about fifteen minutes of prep. Pretty good for Wednesday lunch, eh? Dan was working from home – I didn’t eat it by myself! Here’s what’s great about this recipe. 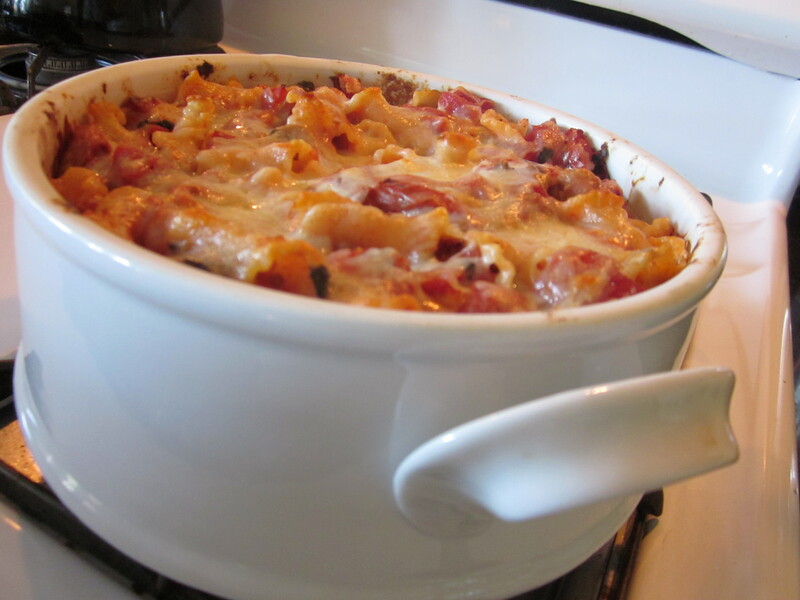 You are using up things you might have tossed (a perfect example is two leftover sauces that are barely a portion each and are mismatched, or the small amount of cheese mixture I hadn’t needed for the ziti…or half a box of pasta that is not quite enough for a full family meal!). It takes minutes to prepare. Also, the ingredients are really flexible. You could have used any sauce, a number of pasta shapes, and even substituted another kind of cheese for the topping (like cheddar). Dan wants me to quote him. He pronounces my grab-bag pasta dish “Delicious!” Go forth and save your scraps. I could never get sick of pasta.